Intel Cedar Trail Atom to have much better graphics? 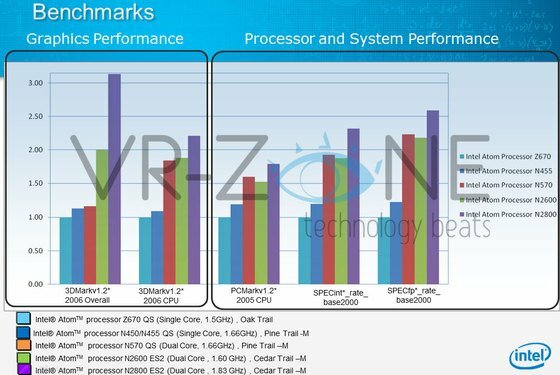 Look at graphics performance we can see that the Atom N2800 performs about three times as fast as the current Atom N570 which goes to show how much faster the new PowerVR graphics engine is compared to Intel's old GMA950 which was tweaked to become the equally poor performing GMA3150. In all fairness, we're looking at a GPU that's clocked over three times as fast as well, so we aren't exactly surprised here. The slower Atom N2600 doubles the graphics performance, or near enough at least, which makes sense as its GPU is only clocked twice as fast. The only graphics metric is 3DMark 06, an out-dated benchmark that doesn't really say much about real world performance and it shows that Intel doesn't care too much about the 3D performance in the first place. It should also be noted that this is unlikely to be with the DirectX 10.1 drivers, as Intel is having enough of a hard time getting its DirectX 9 drivers certified by Microsoft.